For other uses, see Mirage (disambiguation). Various kinds of mirages in one location taken over the course of six minutes, not shown in temporal order. The uppermost inset frame shows an inferior mirage of the Farallon Islands. The second inset frame is the Farallon Islands with a green flash on the left-hand side. 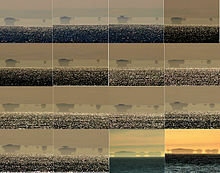 The two lower frames and the main frame all show superior mirages of the Farallon Islands. In these three frames, the superior mirages evolve from a 3-image mirage (an inverted image between two erect ones) to a 5-image mirage, and then back to a 2-image mirage. Such a display is consistent with a Fata Morgana. All frames but the upper one were photographed from about 50–70 feet above sea level. The upper frame was photographed from sea level. A mirage is a naturally occurring optical phenomenon in which light rays bend to produce a displaced image of distant objects or the sky. The word comes to English via the French mirage, from the Latin mirari, meaning "to look at, to wonder at". This is the same root as for "mirror" and "to admire". In contrast to a hallucination, a mirage is a real optical phenomenon that can be captured on camera, since light rays are actually refracted to form the false image at the observer's location. What the image appears to represent, however, is determined by the interpretive faculties of the human mind. For example, inferior images on land are very easily mistaken for the reflections from a small body of watersurface. For exhausted travelers in the desert, an inferior mirage may appear to be a lake of water in the distance. An inferior mirage is called "inferior" because the mirage is located under the real object. The real object in an inferior mirage is the (blue) sky or any distant (therefore bluish) object in that same direction. The mirage causes the observer to see a bright and bluish patch on the ground in the distance which is also called oasis mirage. Light rays coming from a particular distant object all travel through nearly the same air layers and all are bent over about the same amount. Therefore, rays coming from the top of the object will arrive lower than those from the bottom. The image usually is upside down, enhancing the illusion that the sky image seen in the distance is really a water or oil puddle acting as a mirror. Inferior images are not stable. Hot air rises, and cooler air (being more dense) descends, so the layers will mix, giving rise to turbulence. The image will be distorted accordingly. It may be vibrating; it may be vertically extended (towering) or horizontally extended (stooping). If there are several temperature layers, several mirages may mix, perhaps causing double images. In any case, mirages are usually not larger than about half a degree high (same apparent size as the sun and moon) and from objects only a few kilometers away. Heat haze is not related to the atmospheric phenomenon of haze. An artificial mirage, using sugar solutions to simulate the inversion layers. A cat is seen looking through a glass, which has three layers of solution, with decreasing refractive index from bottom to top. The cat appears in multiple images. This simulates an atmosphere with two inversion layers. A superior mirage occurs when the air below the line of sight is colder than the air above it. This unusual arrangement is called a temperature inversion, since warm air above cold air is the opposite of the normal temperature gradient of the atmosphere. Passing through the temperature inversion, the light rays are bent down, and so the image appears above the true object, hence the name superior. Superior mirages are in general less common than inferior mirages, but, when they do occur, they tend to be more stable, as cold air has no tendency to move up and warm air has no tendency to move down. Superior mirages are quite common in polar regions, especially over large sheets of ice that have a uniform low temperature. Superior mirages also occur at more moderate latitudes, although in those cases they are weaker and tend to be less smooth and stable. For example, a distant shoreline may appear to tower and look higher (and, thus, perhaps closer) than it really is. Because of the turbulence, there appear to be dancing spikes and towers. This type of mirage is also called the Fata Morgana or hafgerdingar in the Icelandic language. A superior mirage can be right-side up or upside down, depending on the distance of the true object and the temperature gradient. Often the image appears as a distorted mixture of up and down parts. Superior mirages can have a striking effect due to the Earth's curvature. Were the Earth flat, light rays that bend down would soon hit the ground and only nearby objects would be affected. Since Earth is round, if their downward bending curve is about the same as the curvature of the Earth, light rays can travel large distances, perhaps from beyond the horizon. This was observed and documented for the first time in 1596, when a ship under the command of Willem Barentsz in search of the Northeast passage became stuck in the ice at Novaya Zemlya. The crew was forced to endure the polar winter there. They saw their midwinter night come to an end with the rise of a distorted Sun about two weeks earlier than expected. It was not until the 20th century that science could explain the reason: the real Sun had still been below the horizon, but its light rays followed the curvature of the Earth. This effect is often called a Novaya Zemlya mirage. For every 111.12 kilometres (69.05 mi) the light rays can travel parallel to the Earth's surface, the Sun will appear 1° higher on the horizon. The inversion layer must have just the right temperature gradient over the whole distance to make this possible. In the same way, ships that are in reality so far away that they should not be visible above the geometric horizon may appear on the horizon or even above the horizon as superior mirages. This may explain some stories about flying ships or coastal cities in the sky, as described by some polar explorers. These are examples of so-called Arctic mirages, or hillingar in Icelandic. If the vertical temperature gradient is +12.9 °C per 100 meters (where the positive sign means temperature gets hotter as one goes higher) then horizontal light rays will just follow the curvature of the Earth, and the horizon will appear flat. If the gradient is less (as it almost always is) the rays are not bent enough and get lost in space, which is the normal situation of a spherical, convex "horizon". In some situations, distant objects can get elevated or lowered, stretched or shortened with no mirage involved. A Fata Morgana, the name of which comes from the Italian translation of Morgan le Fay, the fairy shapeshifting half-sister of King Arthur, is a very complex superior mirage. It appears with alternations of compressed and stretched areas, erect images, and inverted images. A Fata Morgana is also a fast-changing mirage. The rays will bend and create arcs. An observer needs to be within an atmospheric duct to be able to see a Fata Morgana. Fata Morgana mirages may be observed from any altitude within the Earth's atmosphere, including from mountaintops or airplanes. A Fata Morgana can go from superior to inferior mirage and back within a few seconds, depending on the constantly changing conditions of the atmosphere. Sixteen frames of the mirage of the Farallon Islands, which cannot be seen from sea level at all under normal conditions because they are located below the horizon, were photographed on the same day. The first fourteen frames have elements of a Fata Morgana display—alternations of compressed and stretched zones. The last two frames were photographed a few hours later around sunset. The air was cooler while the ocean was probably a little bit warmer, which made temperature inversion lower. The mirage was still present, but it was not as complex as it had been a few hours before sunset, and it corresponded no longer to a Fata Morgana but rather to a superior mirage display. Distortions of image and bending of light can produce spectacular effects. In his book Pursuit: The Chase and Sinking of the "Bismarck", the author Ludovic Kennedy describes an incident that allegedly took place below the Denmark Strait during 1941, following the sinking of the Hood. The Bismarck, while pursued by the British cruisers Norfolk and Suffolk, passed out of sight into a sea mist. Within a matter of seconds, the ship re-appeared steaming toward the British ships at high speed. In alarm the cruisers separated, anticipating an imminent attack, and observers from both ships watched in astonishment as the German battleship fluttered, grew indistinct and faded away. Radar watch during these events indicated that the Bismarck had in fact made no changes of course. The conditions for producing a mirage can take place at night. Under most conditions, these are not observed. However, under some circumstances lights from moving vehicles, aircraft, ships, buildings, etc. can be observed at night, even though, as with a daytime mirage, they would not be observable. This includes the mirage of astronomical objects. A mirage of an astronomical object is a naturally occurring optical phenomenon, in which light rays are bent to produce distorted or multiple images of an astronomical object. The mirages might be observed for such astronomical objects as the Sun, the Moon, the planets, bright stars, and very bright comets. The most commonly observed are sunset and sunrise mirages. ^ a b David K. Lynch & William Livingston (2001). Color and Light in Nature (2nd ed.). Cambridge, UK: Cambridge University Press. p. 58. ISBN 978-0-521-77504-5. ^ Durst and Bull (1956). Met. Mag. 85. pp. 237–242. ^ Andrew, Young. Annotated bibliography of mirages, green flashes, atmospheric refraction, etc. Wikimedia Commons has media related to Mirages. Bowley, Roger (2009). "Mirages". Sixty Symbols. Brady Haran for the University of Nottingham.